Hayley is a senior at Centerville High School. 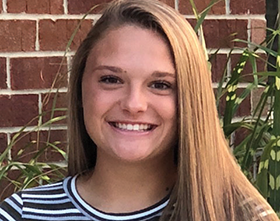 Outside of school, she spends time playing soccer and volunteering for the Centerville-Washington Park District and Dayton Children’s Hospital. Hayley has been a CWPD volunteer for two years, giving her time to Hidden Meadows Day Camp and other activities throughout the year. We would like to thank all volunteers for giving their time and talents to our community! If you are interested in becoming a volunteer, please contact Community Engagement Coordinator Ginger Clark at 937-433-5155 x 234 or gclark@cwpd.org.